Spectacular ocean views from this condo located on the top floor with 1350 sq ft of fabulous living space and a 45 ft private balcony accessible from the living and both bedrooms will make your vacation a memorable one and keep you coming back year after year. 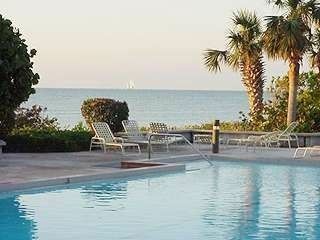 If the dates you need are not available check my other Key West vacation rental (Henry's Piece Of Paradise) located in the same 1800 Atlantic complex. investor owned rentals offered by management companys. Make your reservations now - I easy to reach and easy to talk to.
. View the Atlantic ocean while laying in bed. sleeper sofas in the living room.
. Full size washer and dryer in the unit.
. Smoke and pet free. Ahhh the weather, The average temperature is 77.8 degrees, making Key West the warmest city (average temperature) in the United States. It has never been below 41 or above 98 degrees. Ahhh paradise.
. Over Size whirlpool adjacent to the swimming pool.
. 400 ft. of private ocean footage.
. BBQ with picnic huts.
. Covered / secured parking.
. 1 mile = Famous Duval St. Dining, dancing, live entertainment, partying, shopping, arts or whatever.
. 1 mile = Key West airport. every water sport you can imagine.
. 0--2 miles = Sunset / starlight cruses.
. 2 miles = 18 hole champion golf course.
. 1--2 miles = moped or bicycle rentals.
. 1--2 miles = airplane / seaplane tours. Free parking for 2 vehicles - one spot is gated / secured. 46 in. flat screen in the living room. 32 in. flat screen in the 2 bedrooms. Living room and both bedrooms have sliding doors that open to the balcony with a nice ocean view. Pool Deck - overlooks the ocean - complex has 400 ft. of ocean footage. I am not associated with any property management companies - quality and piece of mind assured by me personally. Good size for 4 adults. Well stocked. Needs a little updating - especially kitchen. Very clean and relaxing,everything you would need has been provided. Beautiful property and location is awesome! Great location! Loved the balcony! Property is maintained very well. Pool, hot tub and amenities are great. Very nice place with all the things you need to enjoy your brief moments indoors while in Key West. The location is not accessible to downtown on foot but you can uber or drive in fine. BEAUTIFUL spacious condo! Great location! All the comforts of home. Clean and well stocked. Loved seeing the previous guest recommendations. I would definitely stay here again! Located in Key West proper (on the isand and on the ocean).